With industry-leading suction and 30% faster clean-up time, this Little Wonder Pro Vac SP will get your job done faster. This Lawn Vacuum is made for speed with the Hydro-Gear hydrostatic transmission and the reliable Honda Engine that provides 9 HP. Front swivel wheels and sleek design allow you to sweep through tight, rough terrain. 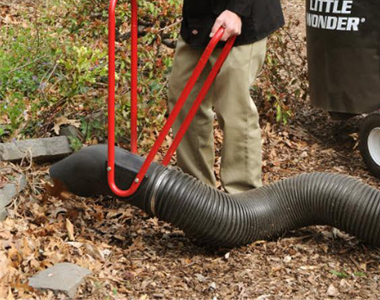 And an 8 bushel bag allows you to collect dirt, leaves, and debris with less dumping. Honda GX270 Engine: Power and reliability is offered with this Honda GX270 engine that provides 270cc and 9 HP. Hydro-Gear Transmission: Reach up to 4.2 mph forward and 1.8 mph reverse speeds with the Hydro Gear hydrostatic transmission to get your job done quickly. Maneuverability: Front swivel wheels make rolling over rugged terrain easy. Compact Unit Design: Sleek, more compact design with a 40" height for clear line of sight. 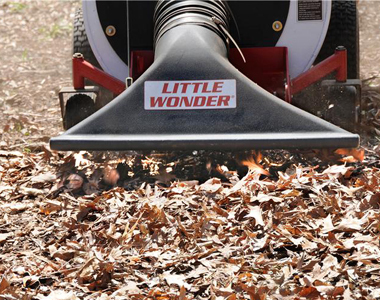 8 Bushel Bag: Collect more dirt, leaves, and debris with this 8 bushel easy on/easy off bag. Warranty: Feel secure with a 2 year commercial warranty. Operator Comfort: Users of any size can find a comfortable operating position with the arched padded handle. Industry-Leading Suction: 20 years of being the top airflow. Nozzle Height Adjustments: Change the nozzle height settings to avoid lawn damage without stopping the engine. Rear Drive Wheels: Get optimal traction on both concrete and grass for better maneuverability. Free-Wheeling: Move around easily even when engine is not engaged. I have received the unit and assembled it, but it will not be put into real service until the falling-leaf season. It arrived with no obvious shipping damage, in spite of abysmally inadequate crating. One of the weak tie-downs to the support pallet had broken, allowing the unit to float inside the remarkably flimsy crate. I credit the freight company with the fact of no obvious shipping damage. The unit looks like it will do the job but the owner's manual is not even barely adequate--for example there is no information on steps required to change the drive belts. This operation, incidentally, looks like a big deal, because a from look at the parts list it appears that it involves removing the fan assembly. Not a good design here for something as wear-prone as a v-belt. Whoever makes the warning labels should learn how to spell, e.g: "receptacle". "Receptical" just does not cut the mustard, and it's staring you right in the face in the operator position. A better design would allow the fan to be turned on and off with the engine running. My rating of "average" may improve once I have used the unit, but right now it looks "average" or possibly slightly even less. the unit is well built and I believe will be able to handle anything that I throw at it. It's to early to tell what problems I'll come across, but again looking at the equipment it's definitely heavy duty. I'll know more when I put it to work. Very powerful with plenty of suction. Nozzle will clog with sticks and long debris. 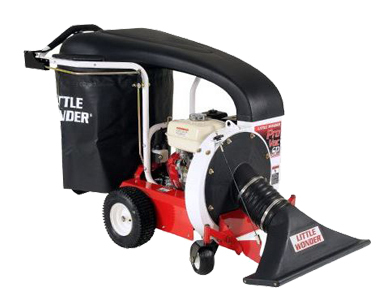 Ask us about the Little Wonder Pro Vac SP 9 HP (Honda) Self-Propelled Lawn Vacuum . Please no repair questions. Your Q&A may be posted to MowersAtJacks.com to help other shoppers, like you, with their purchasing decisions. Thank you. 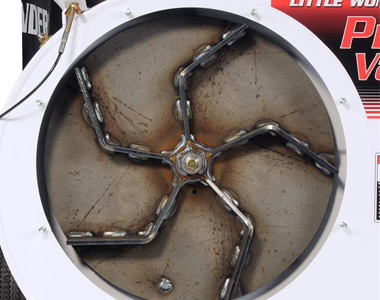 Marquis, there is a 5 blade impeller that chops up debris to reduce the load volume. 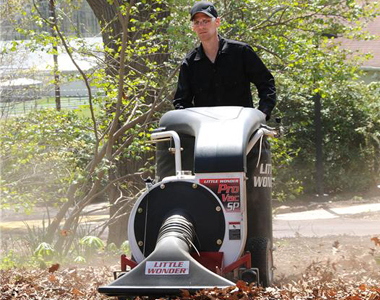 Bruce, the Little Wonder Pro Vac SP is 29 inches wide. How would the warranty be preformed if something goes wrong with unit. Les, you would need to take it to a local Little Wonder dealer for warranty service. Is the vacuum suction adjustable? What is the range of adjustable clearance for the deck? David, according to Little Wonder you can adjust the nozzle to select the height by turning the nozzle control knob and securing the position with the wing nut, however, there is no adjustable clearance for the deck height and the power of the vacuum suction is not adjustable. What optional accessories are available? Of the options available, do any come with this purchase? Are 0% finance options available, or any special interest offers? How heavy is this SP version, and how heavy is the push version? 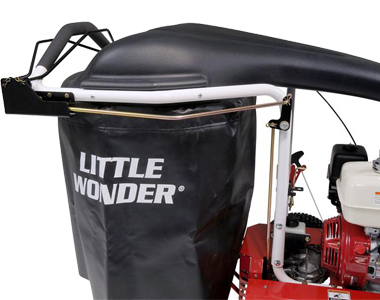 David, optional accessories for the Little Wonder Pro Vac SP include an intake hose kit, nozzle side guard, and felt liner kit. The hose kit allows you to vacuum hard to reach places. 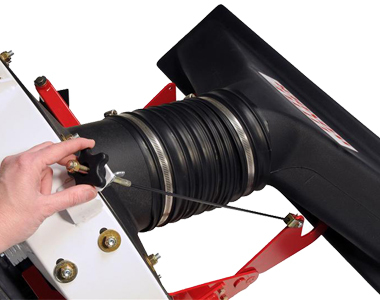 The nozzle guards are metal plates designed to protect the sides of the vacuum nozzle from damage. 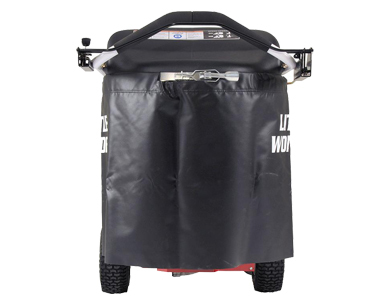 The felt liner kit for the debris bag helps to reduce dust. These accessories are sold separately as options you can select and add to the purchase of the lawn vacuum itself. The Pro Vac SP self-propelled model weighs 280 lbs. while the Pro Vac Push model weighs 184 lbs. Currently, we do not offer finance options for online purchases, only local-store purchases. 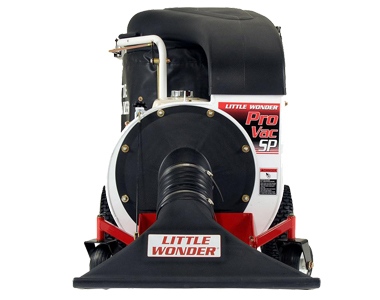 Add options now for your Little Wonder Pro Vac SP at a 1 time discounted price. When you are ready to check out, just click the ADD TO CART button. Description: Intake Hose Kit - 12 ft. hose and dual-handle nozzle attaches to the housing intake for cleaning flower beds and other hard to reach areas. Description: Metal side plates to protect the nozzle from damage. Description: Felt liner for debris bag reduces dust.